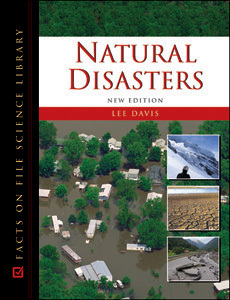 From the Black Plague that spread across Europe in the Middle Ages to recent events such as Hurricane Katrina, Natural Disasters, New Edition provides a comprehensive survey of the natural calamities that have ravaged mankind and altered the course of human history. This fascinating reference features more than 500 entries—nearly 50 of them new and updated—that are organized by disaster type, then alphabetized by the name of the country in which the event occurred. Each section begins with a list of the worst recorded events within the disaster type; a helpful, updated chronology of the events; and an introduction. In addition to providing the basic facts of each disaster, the readable text offers important insight into the background of each event, the ultimate impact on mankind and the environment, and compelling eyewitness accounts. New features include an 8-page insert of 20 compelling full-color photographs, an expanded bibliography, and a helpful listing of Web resources. "...riveting reading...will fascinate readers with its reports, photos, and lesser-known details..."
"...offers readable and reliable facts...recommended for college and public libraries." "Recommended for middle school, high school, and public libraries..."
"...complete and comprehensive...an ideal addition to...library reference collections." "...a welcome addition to libraries for students and others looking for current or historical information on natural disasters and their consequences. Recommended."